Join us for this practical, skills-based “What Matters to You?” webinar! 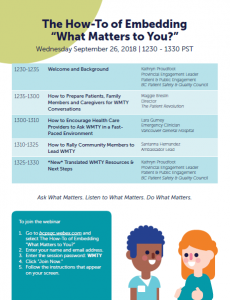 It will be a how-to guide on preparing patients and family members for “What matters to you?” conversations, encouraging health care providers to ask the question, and rallying community members to lead the initiative. Speakers include Maggie Breslin from The Patient Revolution, Lara Gurney from Vancouver General Hospital, and Santanna Hernandez, a “What Matters to You?” Ambassador Lead. 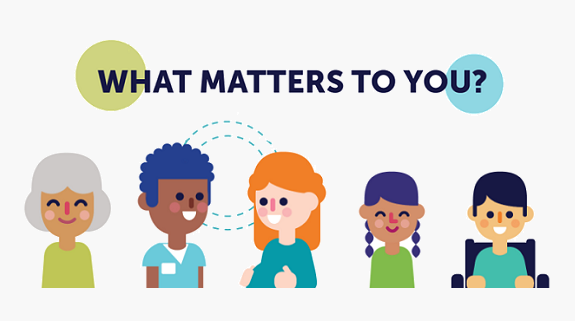 Members of the Patient and Public Engagement team will update attendees on the upcoming release of “What Matters to You?” materials in different languages!